Dear fellow squash players, my name is Tim Burganov and I will be taking care of warranty issues. The following is information about the Xamsa Warranty Program. If you have any concerns after reading, please send me an email and I will get back to you shortly. 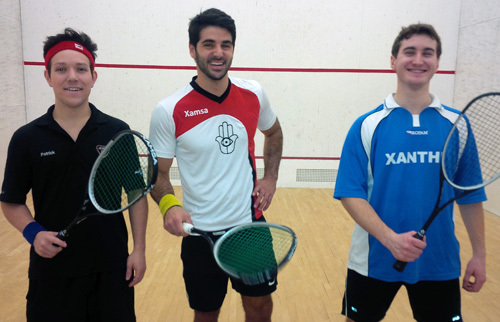 The idea behind creating Xamsa Squash is to promote squash and to offer high quality rackets at fair prices. We do our best to avoid any manufacturing defect however if there is a problem, we are here to resolve it. Due to relatively high cost compared to selling price, we cannot afford a no-fault guarantee program. You are the only person who knows exactly what happened to your racket therefore we leave it up to you to decide. Manufacturing defect. If you believe that your racket broke due to manufacturing defect, please let me know and I will arrange for a replacement at no charge. Contributed damage. If you do not think it was a manufacturing defect, but believe the racket was nonetheless a little too fragile, let's meet half way. We will be happy to sell you a new racket for $50. Significant impact with the wall causing the racket to break. This is not a warranty case however we understand how frustrating it can be to break a racket so quickly. We will gladly sell you a new racket for $75 if you would like to buy one. If your racket broke after 30 days of purchase but you only played with it a couple of times, please don't hesitate to contact me directly. Please rest assured that we will find a satisfactory solution.